Amboseli National Park is famed for its huge elephant herds with Mt. 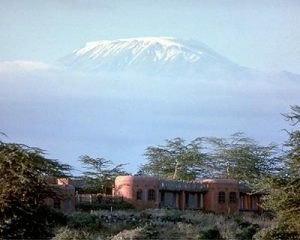 Kilimanjaro standing majestically as a backdrop. Other animals are zebras, buffaloes, lions, giraffes and more. You will be picked up at the airport, hotel or home after which you will depart Southwards towards the Kenya - Tanzania border town of Namanga. Proceed to Amboseli National Park arriving in time for lunch. Afternoon go for a game viewing drive. Amboseli National Park is famed for its huge elephant herds with Mt. Kilimanjaro standing majestically as a backdrop. Other animals are zebras, buffaloes, lions, giraffes and more. Dinner and overnight at Amboseli Sopa Lodge. A sumptuous breakfast at Amboseli Sopa Lodge then drive back to Nairobi for your International flight home. Applicable local and government taxes on accommodation and transportation. Tips and gratuities to driver, guide, hotel/camp and restaurant staff, room service etc. Travel Insurance – Items of a personal nature i.e. Extras at the lodges i.e. drinks, telephone, laundry etc. Any optional tours or excursions not mentioned in the itinerary. Balloon safari, this can be arranged at an extra cost subject to availability.